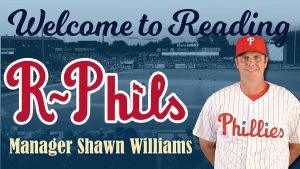 Former Clearwater Threshers manager Shawn Williams will be the R-Phils new manager for the 2019 season as announced by Josh Bonifay, Philadelphia Phillies Director of Player Development. Williams will be joined by returning hitting coach Kevin Riggs, as well as new Fightins pitching coach Aaron Fultz, assistant coach Nelson Prada, athletic trainer Michael Hefta, and strength and conditioning coach Kenny Matanane. Michael Hefta joins Williams and Fultz from Clearwater for his first season in Reading as Athletic Trainer. The 2019 season will be Hefta’s sixth in professional baseball. He spent the past two seasons in Clearwater, and his first three seasons with Williamsport (A). He obtained his Bachelor of Science degree in athletic training from Henderson State University.